Back on Sunday, I also got around to switched the 2 1.5TB drives of my backup storage from the hardware RAID1 of the TR2UT-B, to the TR5M-BP. Was kind of surprised they both showed up as valid drives, Windows was smart enough to offline one due to duplicate signature and it seemed it would just work. Good to know perhaps. Did find the something else missing in the Open Box TR5M-BP....screws. There should've been 20 screws for harddrives (4 for each of the 5 trays). But, there were only 12 screws. Not sure how that maps out. But....not really that worried. Now, I'm not entirely sure why I'm doing RAID1, I had thought about switching it to spanned or RAID0...I suppose either way, I'm toast if one drive fails...but its just backup data. Though having the backup did save my tail once. JBOD could be an option for the kind of backup I'm doing now, though not sure how to implement it with the current backup software (Microsoft)....its already kind of bad in that it deletes the backup before making the new backup. There's room for two backups on the disk right now. Though I've thought I would like to continue my search for a better Windows backup product (i.e. time machine like), instead of the current for disaster recovery and backupppc which exposures windows of 24 hours and greater (due to window constraints, and limits on simultaneous jobs...it can sometimes approach 72 hours since the last backup). And, obviously I'm paranoid of my data, so lots of backups is good. I deleted the partitions, initialized the drives in the rr622 web interface and turned them into a RAID1 set and redid my Windows Image Backup. I didn't note what kind of throughput I had was getting with eSata & TR2UT's hardware RAID1...but the rr622/software RAID1 is slower. The Windows Image Backup took longer than it had been before. But, I didn't feel like messing around with it just yet. First problem was the fan was kind of noisy compared to everything else. Though it wasn't really loud to be a problem, but there was a high pitched whine to it that made it annoying. I had gotten a new fan to have on hand to replace the fan in the other used TR5M-B, I got off of eBay.... (since I had to replace the one in the Rosewill clone a while back.) Haven't had to use it yet. Though I poked around on Amazon to see if there was perhaps a quieter fan to consider. Narrowed down to a couple of choices, and then decided to get both....because I decided that I'm also going to upgrade the case fan in Orac at some point. Then I decided that would break the RAID1 and try spanning....well, it doesn't do that. So, I guess RAID0. Well, a new Windows Image Backup to the RAID0 went much faster than anything I've done before....so that might not be bad. I only needed to scan one photo, and while I do have a Fujitsu ScanSnap 300M somewhere....its Mac only, and I don't own a Mac. I had acquired that scanner during Black Friday last year, not realizing that it was Mac only. It won't even work on Linux. I do occasionally use it, many for scanning receipts. As it was I haven't traveled on business since I got it, so haven't had to scan receipts for work. Though I have used it on occasion to scan receipts for FSA reimbursement. I had intended at one time to have a Mac by now...but other priorities and emergencies have slipped in. 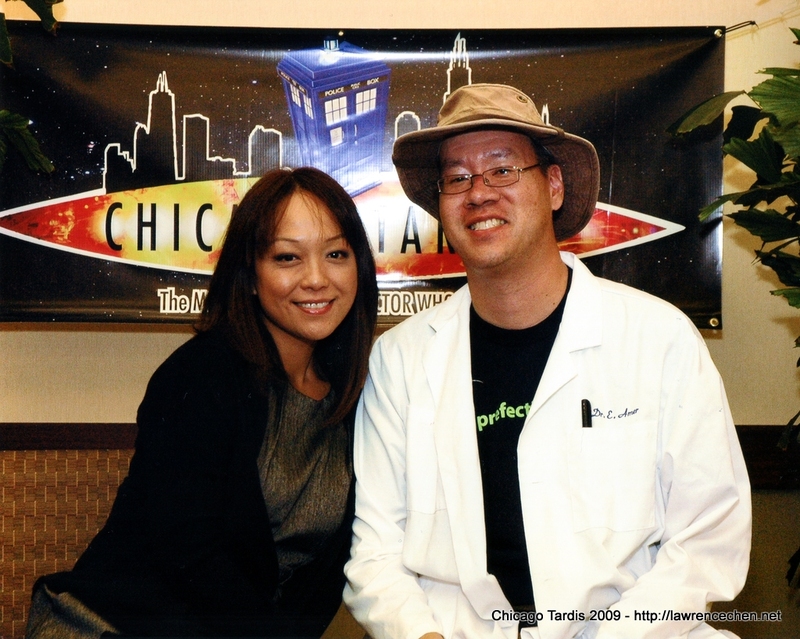 Anyways, while I was at Chicago Tardis, I got into the photo sessions with the actors from the Doctor Who movie, and with Naoko Mori (Toshiko on Torchwood). With the Doctor Who movie, I opted to use my own camera and let somebody snap it....big mistake. A pro knows that you shooting wide angle is wrong. I had zoomed camera to frame up me and the actors, etc. But, the guy taking the picture immediately fiddled with my settings and zoomed to full wide angle. Also resulted in no flash. But, the picture did turn out. With Naoko, there was an extra fee to get a picture done. The program guide said $35, regardless of whether it was done by them *OR* with my camera. Though at the time of the shot, I learned it was $20 to use my own camera...and that I could get either or both. But, I stayed with just the pro shot...though in retrospect, maybe I should've charged the $55 to have both. At least then I'd have an immediate digital copy and the matter of trying to get an 8x10 home undamaged wouldn't have been such a challenge. But, I managed. But, then came how do I share that I had my picture taken with Naoko with friends and family? I think there was an option to order additional prints at the time of session, but that wasn't really the way to go...since its the Internet that connects me with friends and family...and in some cases the only thing that connects us. So, since I had gotten home from Chicago Tardis on CyberMonday, it seemed that I would do a repeat of last year and buy a scanner during the usual BlackFriday/CyberMonday weeekend. Also I again got it from NewEgg. There are 18 years 8 months 27 days 10 hours 58 minutes and 12 seconds until the end of time. And, it has been 6 years 4 months 3 hours 4 minutes and 44 seconds since The Doctor saved us all from the end of the World!